dr.fone - Restore Social App, best assistant to help backup & restore WhatsApp chats easily. Your WhatsApp chats can contain some important information and have sentimental values. By taking a backup of your WhatsApp chats, you can later restore them on your iPhone/Android. It will also help you move from one phone to another without losing the WhatsApp chats. Besides WhatsApp chats, you must be used to exchanging photos and videos with your WhatsApp contacts too. If you don’t want to lose these precious WhatsApp memories, then take a backup of all the WhatsApp videos/photos as well. Retrieve the photos and videos anytime after taking their backup from WhatsApp. Your WhatsApp won’t be of any use without your WhatsApp contacts. While WhatsApp doesn’t provide a direct option to save our contacts, you can use other ways to keep them safe. This will help you stay in touch with your WhatsApp friends even after getting a new iPhone/Android. You can lose your WhatsApp chats due to numerous reasons like iOS system issues, physical damage, faulty apps, etc. To avoid such an unwanted scenario, maintain a backup of your WhatsApp chats and attachments from your iPhone. 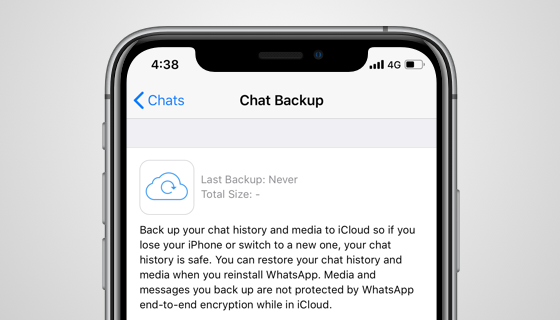 You can turn on the automatic WhatsApp backup in iCloud settings, take a WhatsApp backup via iTunes, or even use a much smarter solution. Go to your iPhone Settings > iCloud and turn on iCloud Drive. From the iCloud Drive Backup list, turn on WhatsApp. 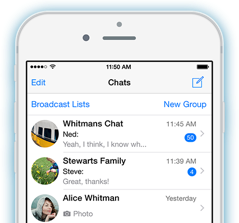 To automate backup, launch WhatsApp and go to its Settings > Chats. 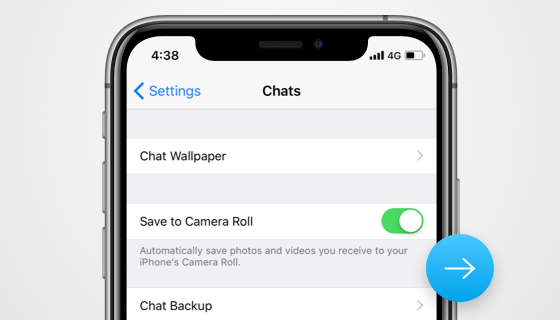 Tap on "Chat Backup" and choose to backup your WhatsApp chats. Turn on the "Auto Backup" option to take automatic WhatsApp chat backup. 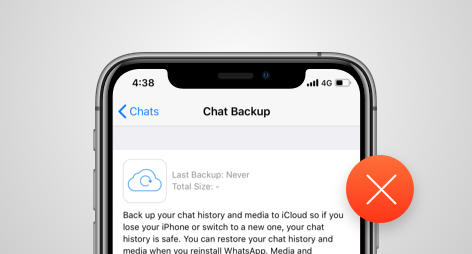 Easy WhatsApp chat backup & restore for iOS. Can include WhatsApp media files. Consume iCloud storage (5 GB free storage only). Cannot preview WhatsApp backup details. Heavily depends on strong Wi-Fi signals. Update your iTunes to the latest version. Launch iTunes on the system and connect your iPhone to it. Select the connected device and go to its Summary. Click on the “Backup Now” button under the Backup tab. Confirm your choice and take an extensive backup of your iPhone. iTunes errors often pop up. Users can't exclusively backup WhatsApp chats. WhatsApp chat backup details are not previewable. Any better solutions to backup WhatsApp chats on iOS? iTunes cannot backup only WhatsApp chats. Whole device backup takes much time. iCloud requires strong Wi-Fi signals for WhatsApp backup. Only 5 GB free storage available. No one can preview what WhatsApp chats were backed up in iTunes & iCloud. Complex operations to backup WhatsApp chats with iTunes and iCloud. 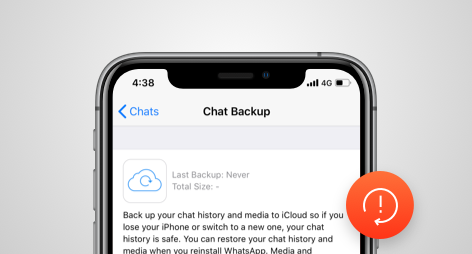 One click to backup WhatsApp chats from iOS/Android to PC. Easily prevews WhatsApp backup details from the backup files. Also supports the backup of Viber, LINE, Kik, Wechat chats to PC. If you have an Android device, then you can easily take a backup of WhatsApp chats and even keep the exchanged WhatsApp media files safe. You can take WhatsApp backups on your local device storage as well as backup online (on the linked Google account via Google Drive). Here’s how you can do it. Open WhatsApp and visit its Settings from the main menu. Go to Chats > Chat Backup. Tap on the “Backup now” option to take an immediate backup. If you enable auto backup, then WhatsApp will take the daily backup at 2 a.m. The file can easily be corrupted. Consumes local storage on Android phone. Launch WhatsApp and visit its Menu > Settings > Chats > Chat Backup. Tap on the “Backup to Google Drive” button. If your account is not added, then tap on the “Add Account” option instead. Turn on the Automatic Backup option to never lose your WhatsApp chats. Consumes storage on Google Drive. 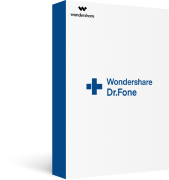 Install and open dr.fone on your PC. Click on "Restore Social App". Connect your Android to the PC, and choose "WhatsApp" > "Backup WhatsApp messages". Wait until WhatsApp backup completes. Taking a WhatsApp backup is not enough. You can also restore the WhatsApp chat backup to a new or the same iOS/Android. The process might vary, depending on your device types and where the WhatsApp backup has been stored. Here are some foolproof ways to restore your WhatsApp chat backup. 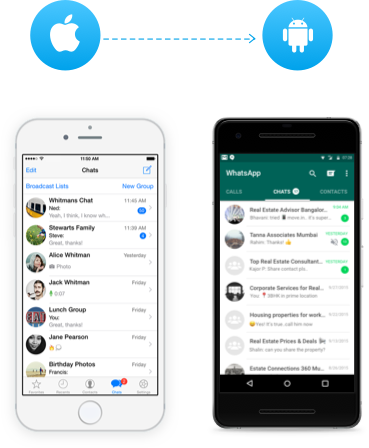 If you have taken a backup of WhatsApp chats on an iPhone, then you can easily restore the WhatsApp messages to the same or another iOS device easily. 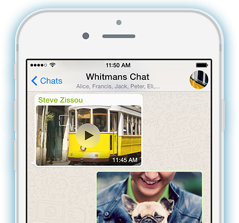 To restore WhatsApp chats, photos, or videos, you can follow these 3 popular approaches. 1. Launch the dr.fone – Restore Social App tool and connect your phone to the system. 2. Choose to restore messages to an iOS device and select the respective backup file. 3. Preview the WhatsApp messages and restore them selectively to your iPhone. Preview WhatsApp messages for selective restoring. Can preview and restore WhatsApp attachments separately. 1. Reset your device if you are already using it. 2. 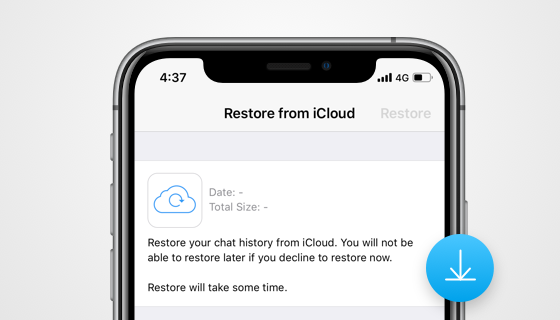 While setting up a new phone, choose to restore it from an iCloud backup. 3. Log-in to the same iCloud account where the WhatsApp backup is stored. 4. Select the respective backup file and restore the entire backup. The whole device would reset (loss of existing data). Users can’t selectively restore WhatsApp chats. Even unwanted data would be restored together. 1. Update iTunes, and launch iTunes on your computer and connect the iOS device to it. 2. Select the connected device and go to its Summary tab. 3. Under the Backups section, click on the “Restore Backup” button. 4. Select the backup you wish to restore and confirm your choice. 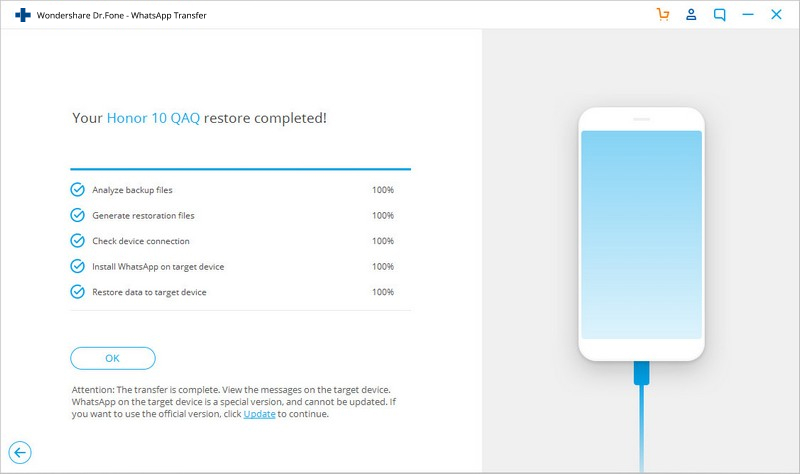 The entire device backup is restored, regardless of WhatsApp data or not. The existing data (other than WhatsApp) on the device would be deleted. Cannot preview WhatsApp chats in iTunes backup. 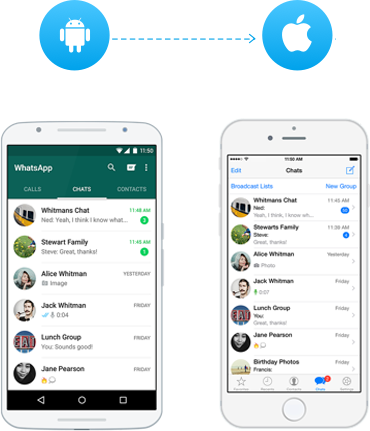 If you are switching from an iOS to Android, then it can be hard to retain your WhatsApp chat data. Since the native WhatsApp solutions like Google Drive or iCloud won’t be of any support, you can take the assistance of a dedicated WhatsApp tool like dr.fone - Restore Social App. 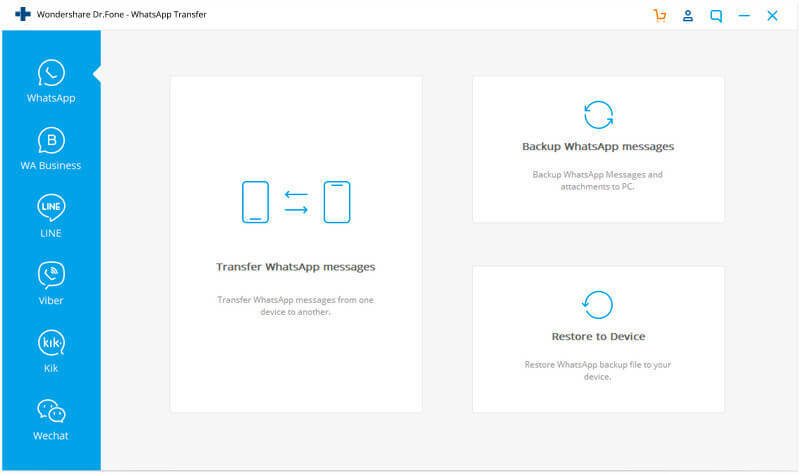 It provides a one-click solution to backup, and restore WhatsApp data across any two devices. Connect your Android to the system and open dr.fone - Restore Social App. Choose to restore WhatsApp chats to an Android device. As a list of the available WhatsApp backup files would be displayed, select the backup of your choice and click on "Next". Preview the exchanged WhatsApp chats and attachments. 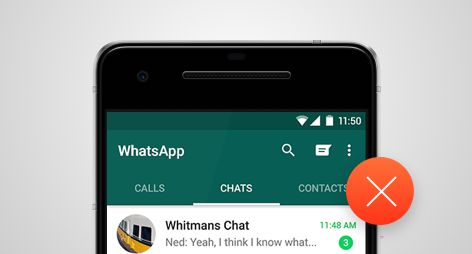 Select and then restore WhatsApp chats of your iPhone to the Android. Restoring WhatsApp chats from Android to Android is relatively easier than performing a cross-platform restoring. 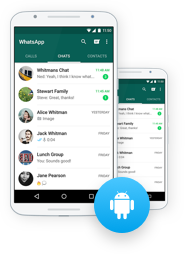 Once you have taken a backup of your WhatsApp chats to Google Drive or the local Android storage, you can easily restore the WhatsApp backup files to any Android easily. Copy the WhatsApp backup file of source Android device and paste it in the WhatsApp database folder of the target device. Install and launch WhatsApp on the target Android device. While setting up your account, choose to restore WhatsApp backup. Select the latest WhatsApp backup file and restore WhatsApp chats to the target Android. While the process can be executed for free, users can’t preview WhatsApp data. The failure rate is high due to the updating encryption algorithm of WhatsApp. You need to learn about how WhatsApp stores files before starting. Install WhatsApp on the target Android and initiate its setup. Provide your phone number and the same Google account where the WhatsApp chat backup is stored. WhatsApp will automatically recognize the user and provide the WhatsApp backup restoring option. Choose to restore WhatsApp chats from an existing Google Drive backup to your target Android. Some WhatsApp chats may be lost if your Google Drive storage is full. Google Drive would replace the existing WhatsApp backup with a new one that may not contain the latest WhatsApp chats. Anyone else with your Google account credentials can access your WhatsApp data this way. Restoring WhatsApp from local storage is complex, and restoring from Google Drive may bring you security risks. Is there a more reliable solution? Launch dr.fone and choose "Restore Social App" from the main menu. Select "WhatsApp" and then "Restore WhatsApp messages to Android device". Select an WhatsApp backup file and click "Restore". Take a backup of WhatsApp chats on Google Drive and later connect the same Google account on the target iPhone. By connecting the same Google account on both the devices, then restore WhatsApp backup from Android to iPhone. Time to get a more reliable solution to restore WhatsApp backup of Android to your iPhone. Connect your iPhone to your computer. Then install and open dr.fone - Restore Social App. Select the "WhatsApp" tab, and click on "Restore WhatsApp messages to iOS device". Browse the historical WhatsApp chat backup files, select the Android file, and click "Restore". Apart from taking a backup of WhatsApp chats and restoring the chats, users often want to read the chats and even delete a WhatsApp backup. 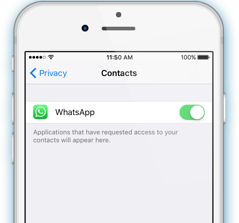 If you are concerned about your WhatsApp privacy and would like to preview your WhatsApp chats, then consider exploring the following options in detail. If you simply want to preview your WhatsApp chats then you need to access the WhatsApp backup file first. Android users can find the encrypted WhatsApp backup file in the WhatsApp database folder. It would be stored as a .db.crypt file. The iOS users can extract the WhatsApp chats through an iCloud or iTunes backup file. Generally, you can use a dedicated extractor tool to preview the WhatsApp data. This would largely depend on how you have maintained a WhatsApp chat backup. For Android devices, WhatsApp chat backup can be saved on the local storage of the device or Google Drive. You can simply copy the WhatsApp backup file from the local drive. Similarly, you can download the WhatsApp backup from Google Drive as well. If you have taken a WhatsApp backup on iCloud, then you can save WhatsApp messages by visiting your iCloud account. If you have maintained a WhatsApp backup on iTunes, then retrieve your WhatsApp chats from an extensive iTunes backup. If you are reselling or donating your old iPhone or Android, then it is important to permanently delete your WhatsApp backup file. This will make sure that your WhatsApp privacy won’t be invaded. Android users can go to the WhatsApp folder on their device storage and manually delete the WhatsApp backup file. In the same way, you can go to your Google Drive and get rid of the existing WhatsApp backup. If you have maintained the WhatsApp backup on your iCloud account, then visit its official website and delete the existing WhatsApp backup file from your account. Additionally, un-link your iCloud account from the iPhone to make sure no one else can access your WhatsApp backup. Not everyone takes a prior backup of their WhatsApp chats. If the automatic WhatsApp backup on your Android or iOS device is turned off, then you might lose your WhatsApp chats unexpectedly. Don’t worry – you can still recover deleted WhatsApp chats without backup by using a smart tool. To recover the lost WhatsApp chats on Android, you can try dr.fone - Recover (Android), which can restore all kinds of lost and deleted content (like deleted photos) under different scenarios. You can also preview the recovered data and restore your WhatsApp chats/attachments selectively. Connect your Android device to the system and launch the dr.fone toolkit. Click "Recover" and choose to retrieve data from the local Android storage. Select if you wish to scan the entire storage or look for only deleted WhatsApp content. Wait for a few minutes as the application would scan your device. Preview the retrieved WhatsApp chats/attachments and restore them. dr.fone - Recover (iOS) is one of the first data recovery tools for iPhone and is known for its high success rate in the industry. It can retrieve all kinds of lost content on an iOS device, including WhatsApp chats and attachments. This tool is fully compatible with leading iOS devices and latest iOS versions. Launch the dr.fone toolkit and connect your iOS device to the system. Open the Recover module and select the type of data you wish to scan on the device storage. Wait for a while as the application would try to retrieve your WhatsApp chats. Preview the retrieved content (WhatsApp chats and attachments) to perform a selective recovery. While WhatsApp is a widely known and advanced application, users still face some unwanted issues. For instance, you might find it hard to take a backup of your WhatsApp chats or recover an existing WhatsApp chat backup. Here are some commonly faced issues related to WhatsApp backup with their easy solutions. Too often, while taking a backup of their WhatsApp chats, users face this problem. Chances are that there could be a conflict with the existing backup or the linked Google/iCloud account. Your Android/iPhone can also halt the WhatsApp backup process due to some security constraints as well. 1. Go to Play Store or App Store and update the version of WhatsApp that you are using. 2. Make sure that WhatsApp supports the Android/iOS version of your device. 3. Confirm an active phone number for your WhatsApp account with no due charges. 4. Close WhatsApp, restart your device, and try taking a WhatsApp chat backup again. 5. Try an effective alternative to backup WhatsApp chats to PC. While taking a backup of your WhatsApp chats on an iPhone, the backup process can be halted in between. From a poor network connection to the lack of space on your iCloud account, there could be different reasons behind it. 1. Check the network connection on your iPhone. Toggle it off and enable it again. 2. Make sure that the linked iCloud account has enough free space to store WhatsApp backup. 3. Go to your device's iCloud settings, log-out of your account, and sign back in. 4. Close WhatsApp and restart your iPhone. 5. Use a PC backup tool to backup WhatsApp chats more reliably. Just like iPhone, the WhatsApp chat backup process can also be stuck on an Android device as well. Mostly, the problem occurs due to a non-verified Google account or a bad internet connection. The following suggestions can easily fix the issue. 1. Turn on the network connection and enable it again. Just be sure that your Android is connected to a stable internet connection. 2. Go to your device’s storage > WhatsApp > Database and delete any existing WhatsApp chat backup that could be causing a conflict. 3. Make sure that the Google Play services are not halting the WhatsApp backup process. 4. Turn off your Android, wait for a while, and restart it. Try taking WhatsApp backup again. 5. Use a workaround way to backup Android WhatsApp chats to PC. Even after taking a WhatsApp chat backup, chances are that you might not be able to restore it to your Android or iOS device. Mostly, users face this problem while doing a cross-platform restoring of WhatsApp backup, or due to WhatsApp backup conflicts with devices. Following suggestions might help you overcome this issue. 1. Ensure that the phone number entered on your new WhatsApp account is the same. 2. Ensure that the operating system of both the devices should be identical. 3. Make sure that your device has enough free storage to restore the WhatsApp backup. 4. Android users should further check that Google Play Services are installed on the device. 5. The iOS/Android device should be connected to a working and stable internet connection. 6. Try dr.fone - Restore Social App to restore WhatsApp chats from Android to Android, Android to iOS, iOS to iOS, and iOS to Android. Recover data from Android/iOS local storages, iCloud and iTunes backups. Manage and transfer photos, music, videos, contacts, messages, etc. between device and PC/Mac. Backup iOS/Android device and social app data to Mac/PC selectively. Fix various iOS/Android system issues without any technical skills.